It is battling big league players such as Daimler Mercedes, Volkswagen Group (MAN/SCANIA), IVECO, DAF, PACCAR and others in an industry undergoing powerful transformation. We’re talking about heavy trucks and Volvo Group, one of the leading actors in this arena globally, just surpassed by Daimler Mercedes in size. Trends like electrification, autonomous vehicles, IoT and other technologies have created immense pressure for change—not only when it comes to the trucks themselves, but equally to how they are developed and manufactured. The Industry 4.0 concept has changed a lot already, but that change is just a light breeze compared to the storm that is now being prepared for in industry. But what does the road to Industry 4.0 factories look like? How are product development and manufacturing platforms affected when the fourth industrial revolution takes an increasingly firm grip on development? And what about the human role in automated environments that future shop floors seem to offer? Volvo’s truck manufacturing operations have embarked on the Industry 4.0 journey, both in terms of vision and practice. Meet Tomas Mörk, Group Trucks Operations (GTO) strategy director, and colleague Claus Biller, head of architecture, and others in the company who have already started working with such tools as big data, analytics and other production technologies related to IoT, automation, data lakes and mobile solutions. “Nothing is simple in this,” is the message. "It gets worse before it gets better, but on the bottom line it gets really good," says Mörk. With an extensive legacy in its backpack, Volvo GTO is, in no way, driving off road; the old and the new must travel in parallel, integrated step by step to eventually incorporation into a state-of-the-art, self-balancing production system. "Vera" is a transport and truck project that Volvo Group is developing related to autonomous and electricity-based transport system solutions for port areas, logistics centers, and shorter distances. It is an elegant, futuristically styled cab and driverless, "cloud-operated" vehicle that Tomas Mörk and Claus Biller show in a video as a prelude to the presentation of the company's Industry 4.0 venture. A huge change, yes, and the size of Volvo’s GTO doesn’t make the transition easier. GTO is responsible for global truck manufacturing, including cab and vehicle assembly, engine production, logistics design, distribution of parts and more. Together, GTO represent approximately 35,000 employees in 70 units on 6 continents. The digitization and the fourth industrial revolution will transform all industries, the truck industry included, Volvo's strategy director explained. They affect the evolution of trucks, in terms of how they are developed, manufactured, and how their operation, support and entire lifecycle look. 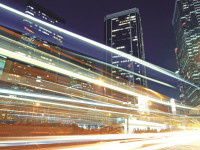 Industry 4.0 will play a significant role in the this new landscape. In a way, these changes that are occurring can be perceived as threats from the perspective that few things will look like they once did over time. Certainly, machines, mobile production stations, robots and cobots (robots working together with people) will take over a lot of what was previously done by people on the shop floor. It is also true that with new technology, fewer people will be needed on the factory floor. However, the good news is that the leaders of Volvo expect that the company will probably still need more employees than before. 3D models, virtual and augmented reality (VR and AR), digital twins and threads will be factors that tie the processes together. 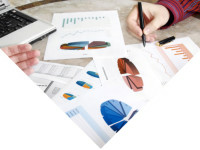 The company’s PLM platform remains, but as part of a whole that clearly bears the mark of a larger Product Innovation Platform(PIP), as defined by analysts CIMdata and Gartner Group. 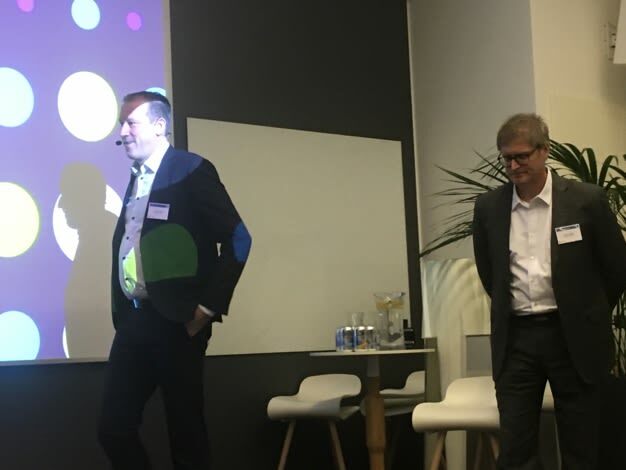 Tomas Mörk (left) and Claus Biller talked about Volvo Group and its Industry 4.0 roadmap. In all of this, the vision is a driving force, according to Mörk. But what does the company see in a more detailed picture? How does it do all of this? This information is used to make Volvo’s products better and increase uptime; trucks that stand still cost money. In order to better understand customer challenges and needs, the parameters that are crucial for each individual customer are optimized. This means that effective variation management is one of the most prioritized properties on new production lines. Generally, each truck is the only one of its kind. In turn, detailed and very precise requirements on production line stations—which also goes for supply chains—are tough to deal with in the pursuit of shorter lead times on the Industry 4.0 journey. Mörk stresses that technical enablers, such as "big data analytics", are key and will be used throughout the production chain. “The production status must be clear and transparent for everyone involved and, of course, digitally based. Electronic boards, bulletin boards, become a part of this,” he added. Other elements are Robotic Process Automation (RPA), a plethora of sensors, which send data to BI solutions for analysis and action proposals, automated or performed by human intervention. In short, Volvo is performing general virtual production preparation and manufacturing. Mobility is another typical feature of the new image of the shop floor. Assembly stations will partly become mobile with advanced control systems that can allocate them to places where assembly jobs are performed. The same applies for complex assembly and advanced adaptations. In the scene that Mörk paints, however, these latter mobile stations probably will be assisted by manned cross-functional teams. A kind of "base assembly" of the vehicles is handled on the main production line, while special adaptations are handled at or by sub-assembly units. The point of a self-balancing system is that it "itself" helps to adjust the production rate in relation to the units that are active and involved in the production/assembly line. 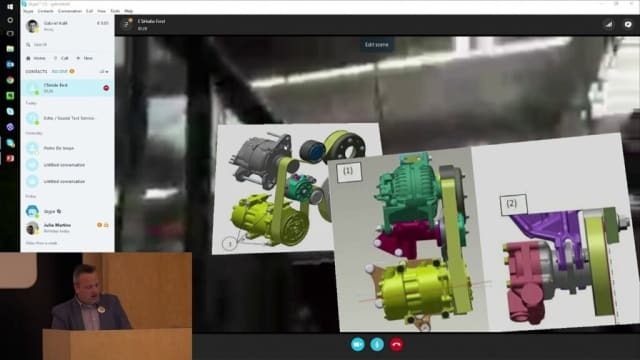 Technical solutions such as VR and AR will be used to visually support how parts should be assembled and provide experiences that concretize and increase insights about production at the individual stations. To this point, Volvo GTO's strategy director said there will be "3D for all,” realized with digital work instructions. Naturally, logistics arrangements in the Industry 4.0 landscape will also be affected. Frequently used parts and components in various assemblies will be organized in "kits" at stations, strategically placed at assembly lines. While more specific components and larger parts will be located in other smart equipment stations. All goods are distributed automatically and without paper. Cross-functional teams will complement the automated stations on production lines, explains Mörk. He adds that "everything is done in real-time connected systems, with monitoring and with automated quality control." Other things that belongs to the Industry 4.0 shop floor arsenal are digital twins and additive technology. With digital twins, the intention is to be able to control and document the product life cycle of the individual vehicles. When it comes to additive manufacturing, 3D printers will be used on an industrial scale to manufacture both fixtures and specific parts for the vehicles where justified. Industry 4.0 in Practice: Volvo’s cab factory, located in Umeå, Sweden, installed Industry 4.0 layouts with advanced automated processes where employees and robots work side by side to ensure quality and precision.“Working in a highly technical factory like the one in Umeå is rewarding for proactive engineers like me and my team. 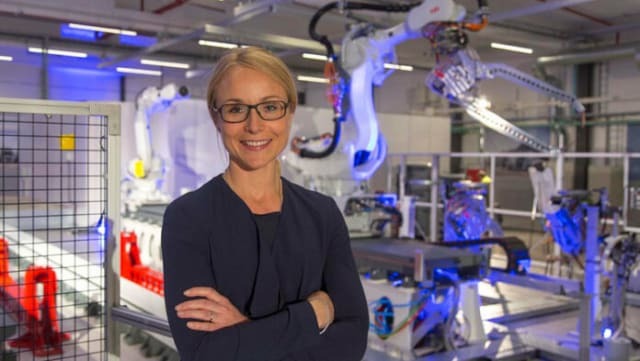 With all the Industry 4.0 technologies that are rapidly developing, we see a tremendous opportunity for further development in our already modern factory,” says Sandra Finér, responsible for Engineering and Maintenance at the Volvo Cab Competence Center. She has the main task of supporting the development of new product and process concepts for cabins, specifically with regard to stamping, body-in-white and surface treatment. If you look into the vehicle factory of today, the landscape is characterized by certain aspects that are highly automated, while other pieces are not, but are in the process of becoming automated. The large number of robots is also a striking characteristic. 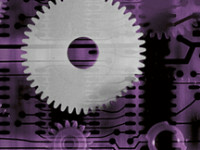 Initially the aim will be to automate parts where repetition is frequent in the workflow. How to solve software that can handle the Industry 4.0 concept remains to be seen. 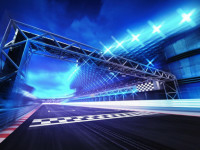 Volvo's Claus Biller, director of architecture at GTO, describes a picture in which the current IT landscape gets "wrapped” with solutions for new capabilities that are linked to legacy bits. This sort of “cover” or “umbrella” contains an IoT platform, a platform for digital exploration, and a data lake solution based on Microsoft's Azure Data Lake. The latter is a storage location where data can be managed regardless of size, shape or speed requirements. An apt analogy that describes the data lake concept is the parable of James Dickson, (founder and CTO at Pentaho: if a traditional ’Data Warehouse’ is like bottled water, a data lake is more like a big puddle of natural water, where data flows in and where users can utilize any data in various forms. 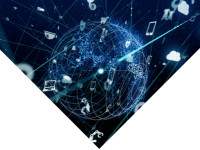 The "wrap" that Biller discusses would include a number of different applications connected to a second line of software apps, including support for and operation of production functionalities. 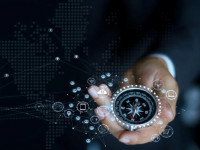 Of course, at the highest level, everything is seamlessly connected to underlying PLM and ERP systems. Uniting IT (Information Technology) and OT (Operational Technology) is critical for an Industry 4.0 setup. However, according to Biller, technology is not the biggest problem on the route to Industry 4.0. It is the culture clash between old and new that is the toughest challenge. “But we have worked well and presently we are advancing faster than planned,” Biller says. In this context, he also points to the importance of getting the suppliers aboard the train. When it comes to the shop floor, Biller tells me that Volvo GTO is currently in an exploration phase. 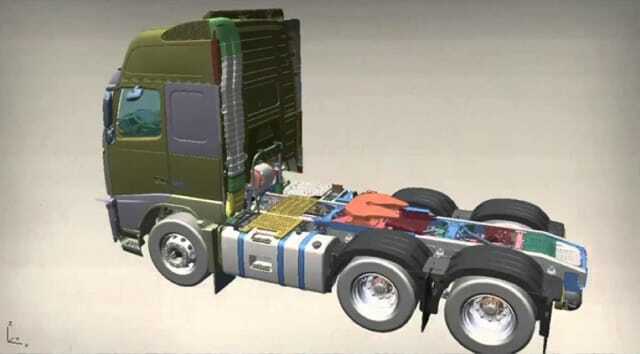 A CAD Model of a Volvo Truck: PTC’s CAD software, Creo, is the company's major tool for 3D modeling. Presently, Volvo Group's PLM system is mainly based on PTC solutions. Creo is the CAD tool used for engine design. PTC's PDM Link (a part of PTC’s PLM suite, Windchill) is primarily used as a CAD vault, while Volvo’s proprietary KOLA solution is the "PDM system" and backbone for product configuration. 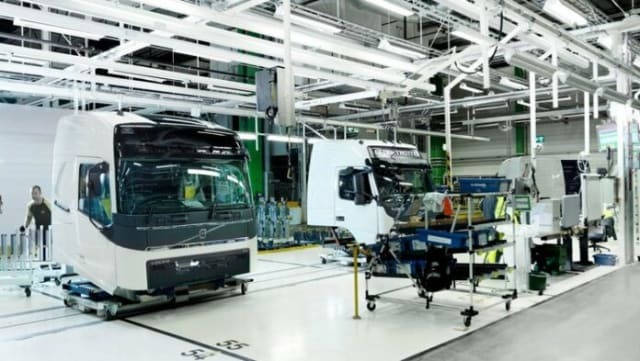 Furthermore, for smart manufacturing, the group also use PTC’s IIoT ThingWorx platform and even the AR/VR platform Vuforia has found its way onto Volvo’s factory floor, both in pilot programs and some instances of production. This doesn’t mean that other vendors are excluded. To some extent, Volvo Group’s environment is diversified, and solutions from Dassault Systèmes (CATIA) are used when it comes to cab design. 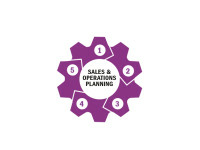 Other vendors represented in Volvo Group are Siemens PLM, with certain modules and specific program solutions; type Product Costing; CD-adapco for simulation; Mentor for electronics design and Teamcenter/Tecnomatix for line balancing. Also, Swedish PLM developer Eurostep's PLCS standards hub has been installed, based on the ShareAspace software for data exchange with partners in product development and manufacturing. The company's way forward with regard to PLM has not been free from problems. Among other things, the investment in Dassault’s ENOVIA (cPDm backbone from Dassault) has cost a lot and the solution was later replaced by PTC's PDM Link. This type of problem is in itself not uncommon in the industry, but miscalculations of this caliber often cost big money; up to tens of millions of dollars. With such baggage, it is no surprise that Volvo acts with some caution when moving forward in support of Industry 4.0 investments. 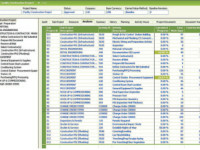 That said, today PTC seems to be the number one PLM and beyond software supplier. ”Yes,” says PTC’s Nordic sales director, Filip Stål, ”PTC plays an active role to support the creation of a digital thread in Volvo; from the early product design phases through production to service and aftermarket in order to bridge the digital and physical worlds." It is clear today that the truck and transport industry will change radically in the coming years. Transport is a cornerstone of the world economy. The world's truck-based transport system is a fundamental social bloodstream, which is now undergoing comprehensive changes. 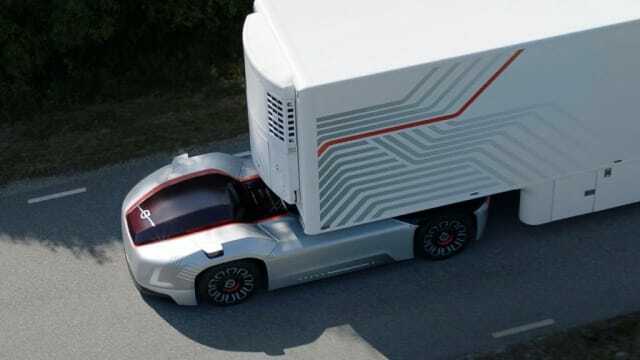 In the near future, we will see autonomous, electric trucks, connected to cloud-based, synchronized operating centers. They will be seen as a natural part of society. 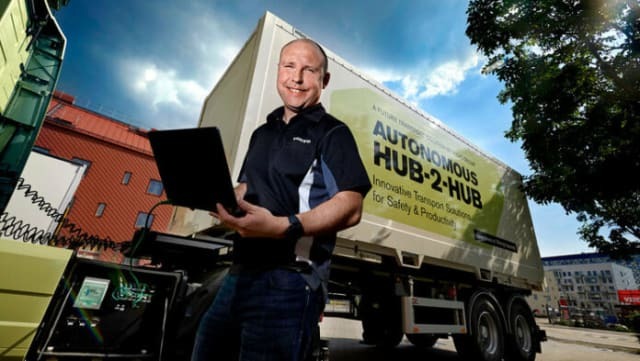 One could imagine that the whole system built up around different hubs, for example between two cities interconnected by a system of self-driving trucks. Perhaps there will be specific lanes for them; perhaps they will be operated as night transports, when traffic intensity in the surrounding environment is low. Maybe shipments are reloaded when coming closer to city centers; moved to smaller and quieter vehicles. Electric power and operation will be self-evident, as well as truck convoys made up of autonomous vehicles, perhaps led by a manned leader truck. Thus, a new kind of ecosystem around truck transports, that are completely interconnected, will become a reality. All of this fundamentally affects the product realization process and Tomas Mörk’s and Claus Biller’s Volvo Group GTO (have embarked on the journey that will keep them on a world-class level.